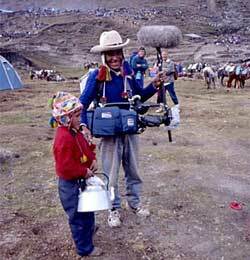 The Conquistadors series airs on PBS May 9th. 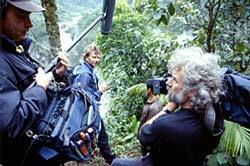 For a complete description of the story behind the story, visit the Maya Vision site, where the crew has created a site describing their experience. More information on Maya Vision can be found on the second page of this section. In the early 16th Century the Spanish Conquistadors reached the shores of the new world. Some 500 years later, they were followed by Michael Wood and the Maya Vision crew. While we were there to follow in the their footsteps we drew the line at claiming the territory for the Spanish crown and settled for capturing a four-part documentary series in the name of the BBC and PBS. During the two years it's been in production, we've carried 22 flightcases over 122,000 miles (five and a half times round the world) and used 40 bottles of mosquito repellent. We spent 30 nights under the stars and took 150 days to shoot 100 hours of footage. We climbed from 0 ft (Isle of Sacrifices) up to 17,000 ft (Quoyllur Riti) in temperatures that ranged from 35°C in the North Mexico desert, to eight-below in Quoyllur Riti. Michael Wood was personally responsible for consuming over 25kg of nuts and raisins while he was on the road. He also managed to count 60 sandfly bites on one of his arms while rafting in the Amazon.